The made in the USA line transforming the American fashion scene. Our latest fashion obsession is a new line called Morrison Grey. The collection is entirely made in LA and takes elegant athletic wear to a whole new level. Inspired by the rebellious American spirit and with an extensive background in fashion, Morrison Grey designers Renee Watson and Marco Quesada noticed a unique niche that needed to be filled within the women’s contemporary market. The growing trend of athleisure wear is upon us – everyone is wearing athletic style clothing on a daily basis and apparel companies are catching on. However, Renee and Marco wanted to offer the comfort and technical aspects of gym attire while creating a fashion forward look that was truly stylish, supremely comfortable and offered everyday elegance. Morrison Grey is defining this trend in a bold and exciting new way with luxurious fabrics and cuts. We like how the pieces in the line transform the usual ready-to-wear look by using unconventional details and unique washes. The line can be found in select boutiques nationwide and Saks Fifth Avenue internationally. Visit http://www.morrisongrey.com/ for more info. When we conjure an image of an iconic African sunset, we picture the silhouette of long-necked gentle giants slowly sauntering along their open savanna, reaching up at the trees to pluck the last remaining succulents. Yet this image may be fast disappearing from reality. New research has suggested that the giraffe – and its nearest relative, the okapi – may enter the ICUN Red List ‘endangered’ category by as early as 2016. The giraffe population is made from nine different subspecies, and has declined from a population of 140,000 individuals in the 1990s, to a little over 80,000 today. In the last seven years alone, the species has been lost entirely from seven African countries. As we continue with programs of mass deforestation, many species are losing their precious natural habitats, and are suffering as a result. Standing up to 18 feet in height, giraffes are vulnerable to losing the protection that dense forest habitats offer, and increasingly the animals are being killed by illegal hunting and poaching. Awareness for these gentle giants needs to be pushed to the forefront of international conservation efforts. Other iconic African mammals such as elephants and lions have long received acknowledgement that their species are in decline, and efforts are being made to salvage them. Giraffes’ conservation status is currently listed as ‘least threatened,’ but the newly updated IUCN Red List will be released this month. Located in the heart of the historical Medina, La Sultana is one of the most beautiful hotels in Marrakech, possibly the world. An oasis of calm, away from the bustle of the kasbah, La Sultana comprises five separate riads cleverly blended to create a peaceful home-away-from-home in the center of one of the world’s most exciting cities. The 28 individually styled bedrooms and suites showcase the very best of Moroccan craftsmanship, it also boasts the largest 1500m2 rooftop terrace in the Golden Triangle that offers 360 degree views of Marrakech and the Atlas Mountains. La Sultana’s urban safaris also allow guest to immerse themselves in the fascinating culture and history of Marrakech. There’s a SHFT happening in consumer consciousness with the creation of a hub for proactive persons who want a better way of forming their lifestyles. Grenier has also joined forces with filmmaker Joshua Zeman to create 52: The Search for the Loneliest Whale in the World, a documentary about the Lonely Whale (aka “52 Hertz”), who communicates at a frequency other whales can’t hear. The project was on Kickstarter, and in the last 24 hours of its campaign the Leonardo DiCaprio Foundation made a $50,000 donation, which allowed the project to meet its funding goal. “This is just the beginning and I can’t wait to share more news with the community,” states a thankful Grenier. Look out for Grenier in the hotly anticipated big-screen version of his hit TV show, Entourage, in theaters on June 5th. Read more ‘Men We Love’ in GREEN IS THE NEW BLACK! Saison means Season in French, which is the inspiration for this premium skincare line. As the seasons change, so does our skin and this elegent line of products are specially formulated for each season and skin type to nourish your skin throughout the changing months. The seasons also influence the ingredients used in each Saison product which are concentrated with the highest-quality, organic plant extracts. Saison is committed to sustainability and product safety and everything in the collection is natural and safe and never tested on animals. The line also contains no petrochemicals, parabens, silicones, phthalates, sulfates, glycols, PEGs, DEA, MEA, TEA, triclosan or synthetic fragrances, colors and dyes. We love all brands who work to help skin, not harm it. Sarah Adler is a nutrition coach, healthy lifestyle expert, food blogger, and owner of Simply Real Health. Her innovative company is on a mission to simplify healthy eating with delectable real food recipes that are uncomplicated and super simple to create. Her method allows more people to eat better, feel healthier and also free up their lives for the things that matter most. We love her latest book which is gorgeous and titled The Simply Real Health Cookbook. It’s a thoughtfully curated collection of her most loved recipes, along with stories and cooking tips. There are recipes for every season that will appeal to every level chef including gluten free, dairy free, and veggie options. It may be ‘The City That Never Sleeps,‘ however that does not mean it is not conscious! With the vast array of choices, New Yorkers are very discerning and are now especially so on the ethical, sustainable and ecological side of life. Located in hip, vibrant Soho, the James Hotel oozes modern, sleek style and has incorporated many eco elements into its design and into its services; floors are made from reclaimed wood, bedding from bamboo and even the rugs are woven from nettle and wood fibers. Mattresses and pillows come from Keetsa, an eco bedding brand, and if guests need to go anywhere, they can catch a ride in the hotel’s hybrid Lexus. Designer Norma Kamali really epitomizes New York style, and in her wonderful flagship store you can find everything from classic designs to bathing suits worn by performers such as Beyoncé and Miley Cyrus. There is also an incredible range of workout clothing and the store even houses her Wellness Café, which offers everything from organic snacks and olive oils to amazing beauty products, including a fabulous line of raw make-up. The Organic Pharmacy carries all of your skin care products, vitamins, medicines and well, make-up of course! We love their quick and effective facial treatments that rejuvenate any skin type, plus the relaxing fragrance and fresh feeling is a quick boost during a busy day in the city. We are huge fans of their Rose Facial Spritz Toner, which can be used all day to rehydrate the skin. And do not forget the Organic Glam bronzer made with Vitamins A, E, and C for an instant healthy glow. Wild has a wonderful, casual ambience and offers some of the very best gluten-free and organic dining in the Big Apple. Their pizzas are divine, their salads fantastically flavorful and their desserts—well, it is hard to choose from so much healthy decadence! This is the perfect place for meeting up with good friends because you will all want to taste everything on the table. GrowNYC’s Union Square Farmers Market is composed of 140 regional farmers, fishers and bakers who sell their products to city dwellers, whilst raising awareness about the environment and recycling. GrowNYC has operated the world famous market for more than forty years, helping to transform NY communities into becoming healthier and more sustainable, whilst also supporting local businesses. The atmosphere is not to be missed, especially on a gorgeous summer day. Soul Cycle claims to be the world’s premier full-body, indoor cycling workout, and judging from their popularity, they are not kidding. Each class is a full-body biking workout, where you will reap the benefits of toning, fat-burning, stress-releasing cardio. Instructors control the low-light atmosphere, and with a nightclub soundtrack, the effects are nothing but healthy. You may well be inspired to change your life once you have attended one of their 45-minute classes. Read more about our New York Eco Chic City Guide in GREEN IS THE NEW BLACK. I grew up on a small farm so this brand had me hooked with the name alone. every item is handmade in Texas and the products are all paraben and sulfate free, with many vegan and gluten-free options. The real bonus though is that they smell INCREDIBLE. Each product also uses up to 99.6% natural and naturally derived ingredients like wild honey, yogurt, clay and pumpkin. Oprah says the Farmhouse Fresh scrubs smell so good, she wants to serve them over berries. Their elegant and totally comprehensive treatment program is offered at luxury resorts like: Red Mountain, Ritz-Carltons and more and Farmhouse Fresh has been selected among the top 5 Favorite Bodycare lines two years in a row by spa professionals. BUAISOU is an artisanal collective, preserving the tradition of Japanese Indigo. Founded in 2012 by two Japanese indigo farmers and dyers, Kenta Watanabe and Kakuo Kaji, the partners develop hand-dyed fabrics, fashion accessories, and home textiles to order. The techniques can be applied to a wide range of organic materials, including wood, paper, bone and leather. The name BUAISOU, pronounced “boo-i-saw”, is in honor of Jiro Shirasu, the first Japanese man who wore American jeans. Indigo Masters Kaji and Watanabe were trained in Tokushima on Shikoku Island in Japan, where the majority of indigo plant production is based. The tradition of producing indigo dye in the region dates back over 700 years. The area is renowned for its indigo leaf farming, as well as for composting the leaves into ‘sukumo’, using a technique of fermentation in ash lye, calcium hydroxide, and wheat bran, otherwise known as a ‘hell vat’. Kaji and Watanabe harvest indigo leaves throughout summer, and compost them during winter to make sukumo. Working with traditional vats, the partners follow the time-honored fermentation recipe of the region. The name ‘hell vat’ comes from the complex and painstaking care it takes to create and maintain. The garments dyed in the vat is one hundred percent natural, and dyes natural fibers a deep and luminous ‘Japan Blue’, that can be washed with white garments without any transfer. The BUAISOU team are the first of the Tokushima indigo collective to bring the ‘Indigo farm to closet’ concept into the 21st century. 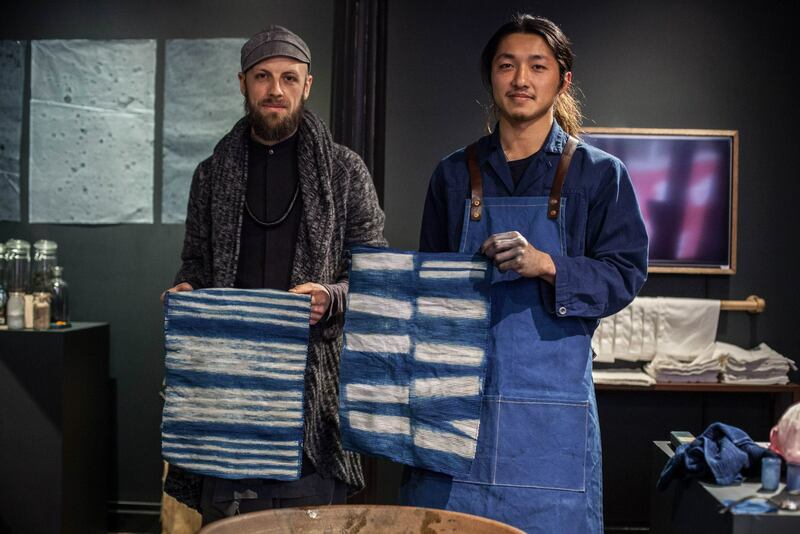 Their mission is to bring the master dyer Kakuo Kaji’s workshop from the farm in Japan to Brooklyn, introducing hands on Indigo workshops to the local community. BUAISOU are creating an educational program in Brooklyn, where Kaji and Watanabe will recreate traditional hell vats with sukumo shipped directly from the farm in Tokushima. Now a team of four artisans, BUAISOU is preserving the tradition of Japanese indigo, striving to bring new vitality to “Japan Blue,” through artistic and functional creations.